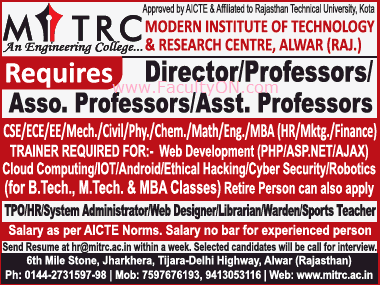 Modern Institute of Technology and Research Centre, Alwar has advertised in THE TIMES OF INDIA newspaper for recruitment of Professor / Associate Professor / Assistant Professor / Director Plus Non-Faculty jobs vacancies. Interested and eligible job aspirants are requested to apply within 07 days from 14th November 2018. Check out further more details below. About College: MITRC Alwar provides students with state-of-the art infrastructure which helps them to attain understanding of their chosen engineering discipline. Engineering transforms scientific discoveries into technological solutions for the benefit of humanity. Everything we rely on for work, life and play has been touched by Engineering. How to Apply: Interested and eligible candidates are requested to send application along with CV, copies of certificates and recent passport size photos to the email address provided below.